A big thank you to Betty Dickinson for the donation of this wonderful photo. Family names are below. (Be patient while it loads). 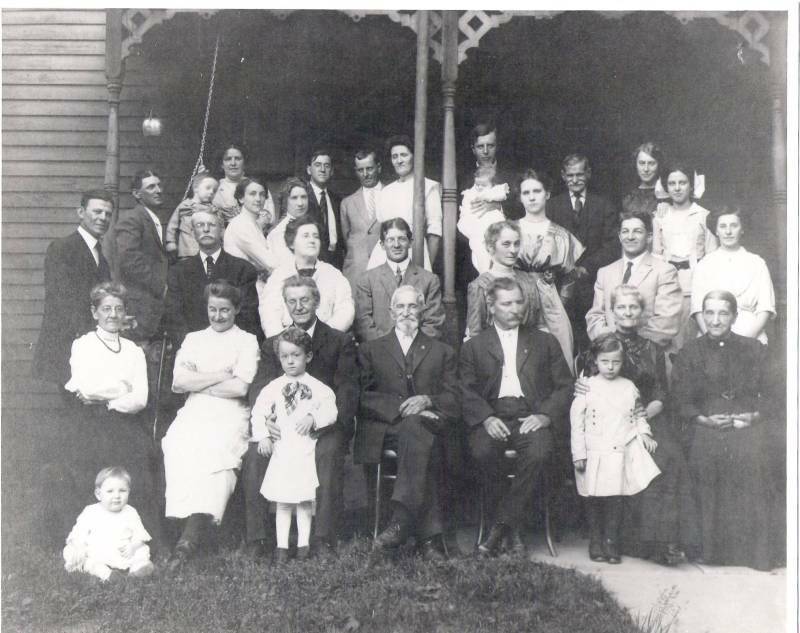 First row sitting from the left - Ella Danley, Minnie Lineham, Charles Cassell with his grandson Leonard Cassell standing, John Cassell, Frank Cassell, Annie Andrews with her granddaughter Irma Stivers (standing) and Ella Chandler. Second row standing from the left - Ralph Danley, John Linehan, Kate Cassell (wife of Charles), Otto Cassell, Dora Cassell (wife of Frank), Dr. (L. E.) Cassell and Zula Stiver. Third row standing from the left - Fred Cassell, Harold Cassell (Ott Cassell's little boy), nettie Cassell (wife of Charles Leonard), Grace Andrews, hired girl at Cassell's, and Laura Pettus (step-granddaughter of John Cassell). Back row - Mable Cassell (Fred's wife), Charles Leonard (Doc) Cassell, Tom Cassell and wife Kate, Will Stivers and son Freddie, David Albert, and Mildred Andrews.